Late Sept/Early October, 2018 Trail Cam Catch Craft UFO? Mississippi, U.S.
Late Sept/Early October, 2018 Trail Cam Catch, Crypto/UFO? Byhalia, Mississippi, U.S. 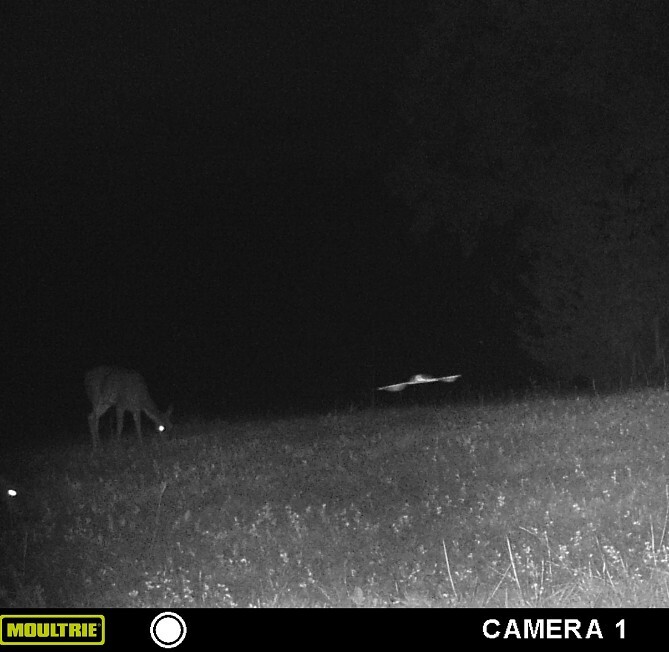 This is probably nothing; it is simply a picture from my husband's hunting camera that we could not explain and that is all. The date on it is not accurate--he's never adjusted it to reflect the correct date; the actual picture is probably late Sept-early October 2018. On some of the frames before it you can see some orb-looking lights that could be bugs or eyes, but they seem high in the sky for that; then on just this one frame is this strange-looking anomaly. My husband is a huge skeptic, but still fascinated by this frame. He has looked at literally thousands of these type of frames and never seen anything like it. BEAMS Comment: Is this simply a blurred bug passing the camera lens... a BLURFO? or a 'Rod' as they are known; or does this image show something FAR more interesting as we first thought. Maybe we are mistaken; but, right or wrong, we thought it worthy of reproducing here, because unlike most afterimage traces of flying insects and their wingbeats, this example looks somewhat metallic! and with a turret! but is it all just an optical illusion? We know that UFO can come in all shapes and sizes, but in this picture, the deer doesn't seem concerned by the presence of this seemingly unusual flying object; but then again, the speed that some UFOs can arrive and depart at, that's hardly surprising! We're 50/50 on this one. Thoughts from another BEAMS Researcher about this photo. This one is fascinating! I don't have a clue what it is, but I think a few things can be eliminated. I first thought it might be an owl hunting low over a field with wings outstretched. However, owls and, I believe, most birds are high or mid wing creatures. 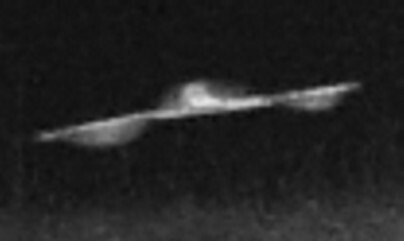 This object is a low winged "something". I think this also eliminates an insect. I believe most insects are also high or mid winged creatures. Certainly moths seem to be a high wing insect, but I am far from a moth expert. I fly radio controlled aircraft, and this looks very much like a low winged trainer airplane, except for the fuzzy aileron-like "blurs" located outboard of mid wing. With an airplane those flight control features would be located a bit closer to the fuselage. I am particularly fascinated by the straight line formed by the "wing". There seems to be no curve that I would associate with a bird's wing, and this gives it a somewhat mechanical appearance. Because I've never used a trail cam, I don't know much about how the image exposure works on them. This image is pretty bright as are some small bright objects in the field. Is a flash used? Is there a means of illuminating the subject, or is the image illuminated simply because a fast "film" exposure is used, and, therefore, only ambient light is used. Why is the object so well illuminated? One also has to consider the possibility that this is something on the lens of the camera. In any case, I suspect many of us will keep this image in the back of our minds, and return to it every so often to consider others possibilities.